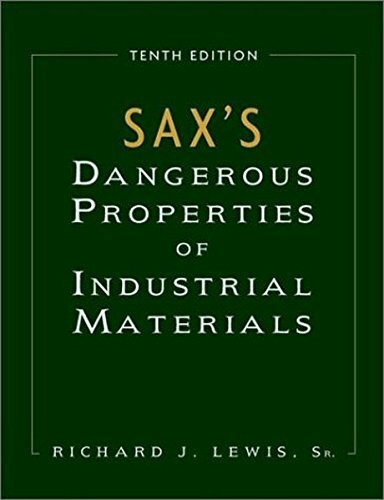 Since its inception in the early 1950s this book has become a standard reference for those who need to evaluate the hazard of substances used in commerce. It combines data on toxicological, fire, reactivity, explosive potential, and regulatory information for over 23,700 substances. Where avaiable, each entry inlcudes: DPIM code, hazard rating, entry name, CAS number, DOT number, molecular formula, molecular weight, line structural formula, description of material and physical properties and synonyms. There are: 2165 new chemicals, drugs and biological substances; 8000 revised or updated entries; CAS registry numbers for more than 21,334 entries; 108,000 domestic and international synonyms; new design and typeface for easier reading; updated and streamlined toxicity data; ACGIH TLVs and BEIs reflect recommendations and include intended changes; advanced safety profiles for handling spills, accidental exposure and fires; and information on chemicals containing pesticides or lead.